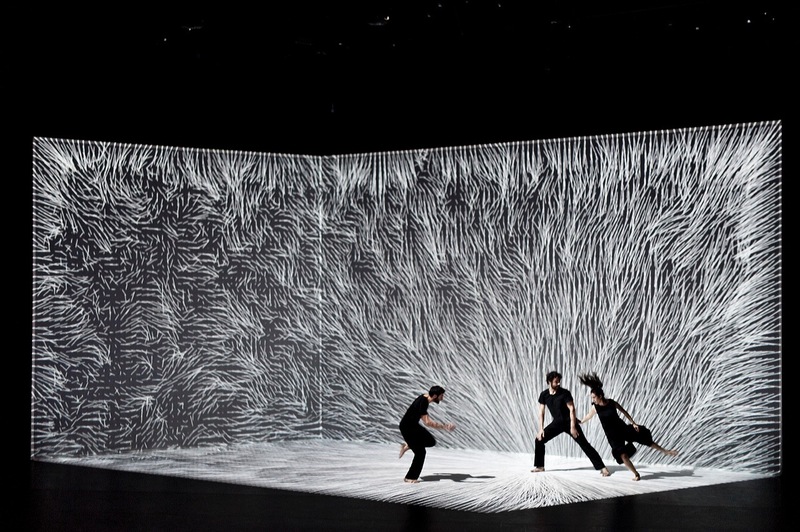 Modern dance goes 3D in a reactive projection-mapped performance by bleeding edge multimedia choreographers Adrien M and Claire B. The creative duo with a habit of bending our perceptions of dance just released a video spot for The Movement of the Air, performed last month in France. 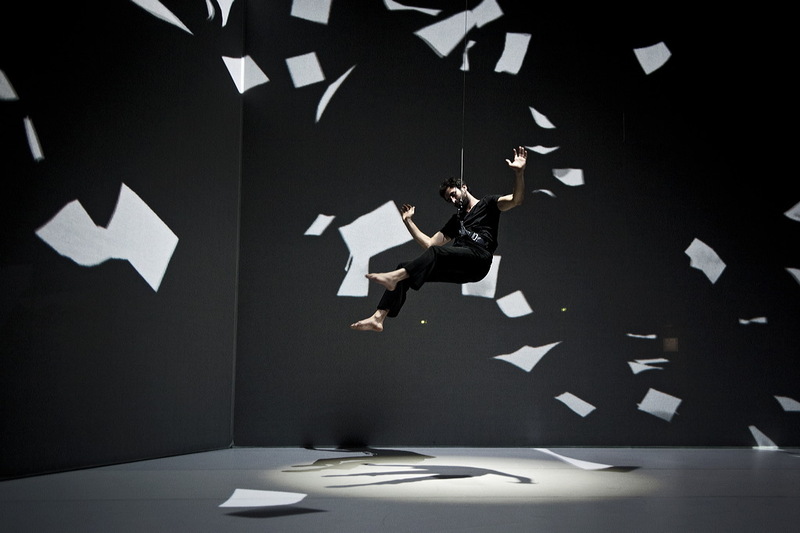 Dancers hang from the ceiling, manipulating the reactive visuals behind them their gestures while a video artist guides the show through each animation. Instead of the martial arts-like moves that that stunned us in Hakanai earlier this year, collaborators Rémi Boissy, Farid-Ayelem Rahmouni, and Maëlle Reymond manipulate tornadoes, columns of smoke, and lively geometric shapes in real time. 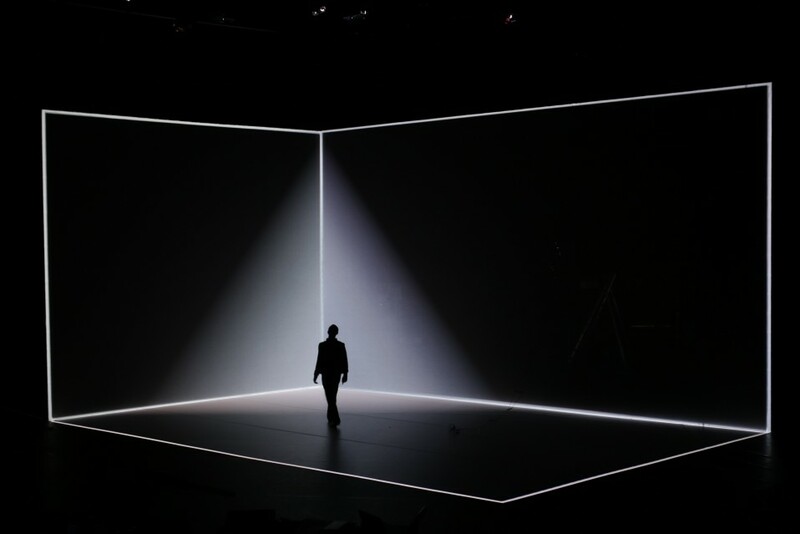 Unlike normal projection mapping, which relies heavily on pre-planning a show to fit every contour and crevice of a surface, Adrien M and Claire B let shapes and patterns emerge in response to the people on stage. Plus the dancers move to the rhythm of live music, adding one more layer of irreplicable humanity to the show. Their brand of performance is part of a larger trend toward reactive sensors bringing projection mapping out of its infant stages. Japanese artist Omote used facial tracking tech to map reactive light “make-up” onto his subjects. Montreal’s Maotik used a balloon to map stunning shapes onto the Society of Art and Technology’s massive observation dome. Back in 2012, Chris Milk used a similar concept to create The Treachery of Sanctuary, which turns onlookers into a shadowy winged beast—then lets them fly away by flapping their arms. Rather than feeling like artists experimenting with new tech for the sake of experimentation, these projects feel like they belong to auteurs savvily using the tools that exist to express themselves. The Creators Project: When was this video captured? What was the venue and story behind The Movement of Air performance in France? Adrien M & Claire B: Most of the video was captured in the beautiful Théâtre de l’Archipel, in Perpignan for the Premiere on the 7th of October, but some view are also been shot last week from the Hexagone Theater, scène nationale Art-Science of Meylan (in the Grenoble area). We have been working on the project for 2 years, with around 4 months of rehearsal on stage, in the theaters co-producers. At the beginning, there is a dream: to make the float around space, and join the images in the air. Then we started to search technical issues for mechanic suspensions for bodies, and fluids movement for graphic objects. We have also built a strong amount of references and stories about the air imaginary, to build a show with a language based on the combination of live video images, bodies in motion and live music. Can you describe the technical setup behind the project in your own words? 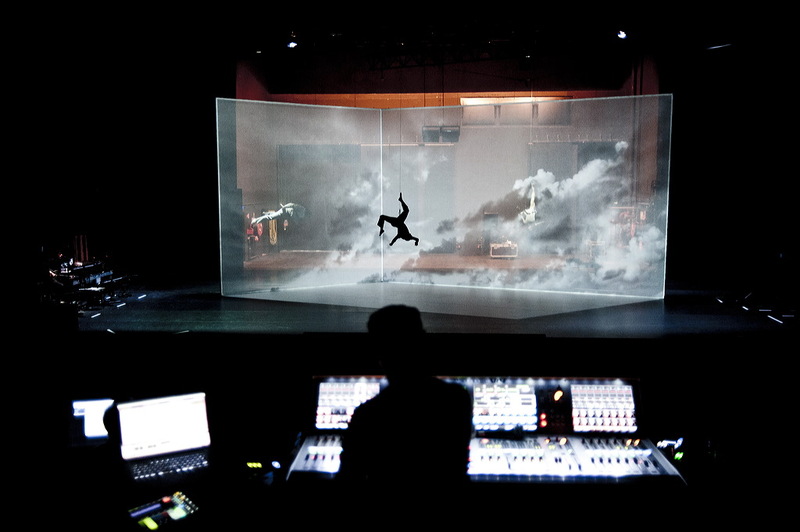 The set is inhabited by a 3 face structure: two vertical panels of white gauze and a white dance oor are asymmetrically combined to create an immersive projection system. This « living light » is produced by video projectors and generated in real time by a set of algorithms. It is a mix of control room operated human interventions and onstage sensors data that outlines a precise writing of motions and generative behaviors. They are generated according to physical models and therefore remind everyone of their own real life experience and imaginary of motion. What is the impact you hope or expect to have on the audience? More generally, we want to transmit a warm and soft feeling of the technology, that can help to embody poetic, magic, and sensitive dreams. Our quest is a motion-driven onirism. We want people to feel like they dream eyes wide open, share a collective mirage. What was the biggest challenge you overcame in making The Movement of Air? We changed our workflow with a new software architecture based on the upcoming software Millumin 2 . It’s a very exciting move : we have been working for almost ten years with our own custom made software eMotion, and now with the wonderful team of Anome we can imagine how we will work for the next decade! It was a big challenge because the app was in early beta, and we needed to anticipate the final result a lot. It’s about making the invisible visible. The images make perceptible air, sometimes set in motion by the movement of the dancers, sometimes moving their bodies.